50 first pre-orders receive awesome tote bag! Since her debut on Food Network in 2002 with the hit program Everyday Italian, Giada De Laurentiis has been enticing Americans with her updated twists on Italian favorites. Her dedication to ease, healthfulness, and—above all else—flavor have won her a permanent place in the hearts of home cooks. In Giada at Home, she shares a personal look into how she cooks for those dearest to her, with simple recipes inspired by her television show of the same name. 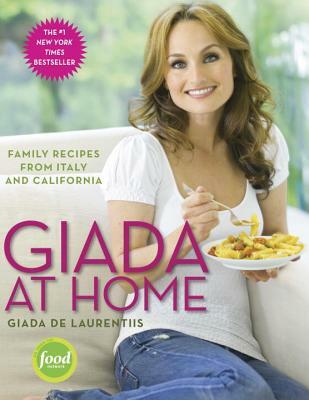 Born in Italy, Giada was raised in Los Angeles by a gregarious Italian family. While her grandmother, aunt, and mother brought her up on generations-old recipes, Giada also became enamored with the bright and clean flavors of California’s abundant seasonal fruits and vegetables. Giada at Home presents recipes from both traditions, all with Giada’s signature style. She shares classic Italian recipes passed down through the years, like cheese-stuffed dates wrapped in salty prosciutto, creamy risotto with the earthy and deep flavors of mushrooms and gorgonzola, and lamb chops basted with honey and balsamic vinegar. New family favorites include grilled asparagus and melon, game hens roasted with citrus and herbs, and a sorbet made with pomegranate and mint, all bursting with fresh, vibrant flavors. No meal would be complete without the company of family and Giada particularly enjoys bringing her loved ones together over meals. For the first time, she incorporates her go-to brunch recipes—what she cooks when setting up a feast on her back patio for everyone on weekend mornings—from Jade-approved Panini, with gooey mozzarella, luscious raspberries, and a sprinkling of brown sugar, to Todd’s favorite pancetta-studded waffles scented with cinnamon. No matter which recipe you choose—classic or contemporary—Giada at Home makes gathering the favorite people in your life for fabulous weeknight meals and family celebrations delicious and easy. GIADA DE LAURENTIIS is the Emmy-winning star of Food Network’s Everyday Italian, Giada's Weekend Getaways, and Giada at Home; a contributing correspondent for NBC’s Today; and the author of four New York Times bestselling cookbooks. She attended the Cordon Bleu in Paris and worked at Wolfgang Puck’s Spago restaurant in Los Angeles before starting her own catering company, GDL Foods. Born in Rome, she grew up in Los Angeles, where she now lives with her husband, Todd, and their daughter, Jade.